A man wearing a red “Make America Great Again” hat sliced open another man’s hand after getting into an argument with him outside a roller-skating rink in San Francisco. The attack happened last Friday outside the Church of 8 Wheels at the former Sacred Heart Catholic Church. According to police, the men got into a heated altercation just outside of the venue. Things escalated as the man in the MAGA hat began shouting homophobic slurs at the victim. When the victim tried to grab the hat, the attacker pulled out a sword and slashed open his hand. 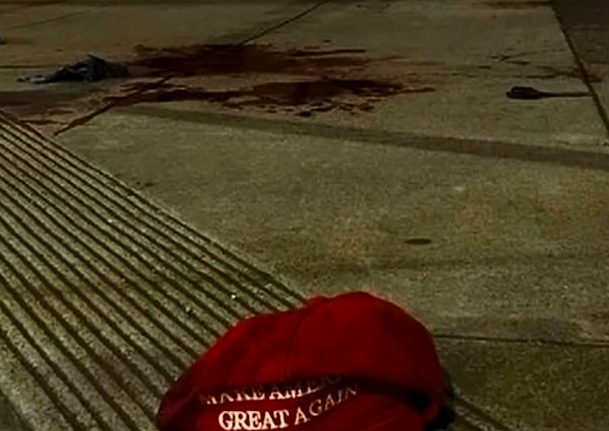 The red MAGA hat, which has become a universally known accessory for supporters of President Trump, was left on the sidewalk near a pool of blood. Police said the victim had tried to grab the hat when the wearer pulled out his sword and slashed the victim in the hand. Investigators have spoken with eyewitnesses and are looking for video surveillance footage. 24-year-old Scott Sweeney witnessed the attack from across the street. The victim was taken to a local hospital where we was treated for non-life threatening injuries. As soon as I saw the headline I knew this would be a Graham Gremore article. It will be a while before the real sequence of events come out. The fact that they made mention of the hat coming off during the tussle makes me think the hat removal was the instigating factor. How on earth could someone conceal a sword though. he was dressed as a pirate, and aggressive with others prior to the incident. What a shock, somebody wearing a MAGA hat is a bigot. No surprise here, a MAGAt attacks someone and screams homophobic slurs, but then Drumpf has encouraged violence repeatedly and coddles homophobes like his VP, many in his party and many of his supporters. OK, time for the Drumpf cult to bring up Jussie Smollett and Kevin Hart and OJ! You should never try to grab a MAGA hat off a homophobe’s head, no matter what nasty stuff he says. It’s wrong to do that. Also you could get lice, scabies (or worse) from the hat, because MAGA morons tend to be opioid addicts so they often sleep under bridges, go dumpster-diving, and the like. So don’t touch that hat!